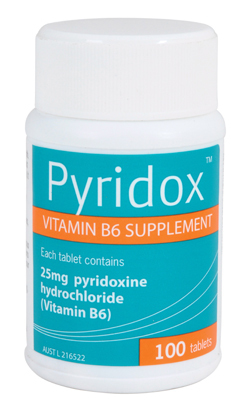 Pyridox contains pyridoxine hydrochloride 25mg (Vitamin B6) per tablet. Vitamin B6 (pyridoxine) is an essential nutrient to the body's health. Vitamin B6 helps to relieve premenstrual symptoms such as breast tenderness, fluid retention, fatigue, mood changes and irritability. It also helps relieve nausea in pregnancy. Adult Dosage: Take 1 to 4 tablets daily with food or as advised by your healthcare professional. Contains no added sugar, gluten, salt, yeast, artificial preservatives, colourings, flavourings or sweetners. This product contains lactose. Store below 30°C. Pyridox tablets are equivalent to Pyroxin 25mg tablets (TM Sanofi-Aventis Australia Pty Limited).